HAIR: Sage-brown and down past her shoulders. Slightly wavy. PHYSICAL DESCRIPTION: Tall and tan, with a slim waist and not too many curves. Strong arms and legs, and long, dextrous fingers. VOICE QUALITY: Sweet and rich and strong. CLOTHING: Usually orange and green, simple clothing, like once-piece dresses or a tunic and tan pants. Usually wears a bandana. JEWELRY: Sometimes wears big dangly hoop earrings, but mostly brooches at her throat or rings or necklaces. FAMILY: None she knows of. Raised by adept singers and harpers. SO/R: Willing to experiment. No partners as of yet. SKILLS: Singing, playing instruments. Swimming, running. PASTIMES/HOBBIES: Playing, singing, tidying cathair. PERSONALITY: Brisk and confident; friendly. Wondering who this Adao person is, you firmly pound on the door with the knocker. You hear quick footsteps, and an alto voice, like the sweet freedom of summer, calling, "I'm coming, coming, wait a moment, can't you?" A young woman answers the door, perhaps twenty years or so of age. Her sand-colored hair falls past her shoulders, unchecked, except by a a green and orange bandana, wound tight about her head. She grimaces, not completely unkindly, and nods curtly. "So you're the writer I've heard about, eh? Well, come in, but it's not quite a cathair. You see, although I was Found, I was never planning to become a dragonrider." Adao shows you inside to a cozy 'cathair', decorated in startling shades of orange, green, and gold. Against a wall stands a small table; a lamp and a plate of hot rolls rest upon it. Adao gestures for you to eat your fill, and you snag a few rolls, stuffing them into your pouch. Her unnerving light gray eyes crinkle at the corners as she watches your greediness, and she shrugs, continuing. Another table, in what seems to be a sitting room, holds a few delicately painted jars, filled with numbing salve and oil. "Those aren't completely for a dragon, if I Imprint. I use numbing salve for bad scrapes or cuts, and the oil soothes my maddeningly dry skin." You sit on a small, comfortable couch, and observe your surroundings, noting them in your Records. Standing up, you follow Adao to her sleeping quarters. A small bed lies in the center of the room. The room is well-organized and clean, with a well-woven rug, with 'earthy' tones. Adao goes to sit on her bed, which is covered with a thick, warm sunny yellow blanket. Looking around, you spot another dresser to the North of the bed; on top is a Journal, and a key. Inside are a few musical instruments; a wooden pipe, a small harp. A guitar lies on the floor next to the dresser. To the East of the bed is a closet hewn out of the wall. A few elegant dresses hang inside. Boots rest on the floor of the closet, and a jacket, a helmet, goggles, and gloves are set near them. To the West of the bed is a small desk. On the desk are a few hides and some ink. Inside the desk are a few elements of Healing; more bottles of numbing salve and oil, thread, and a few needles. Adao rises, and leads you to her eating quarters. A low table, almost to the ground, is in the center of the room. On a counter rests a flask of white wine. Adao pours you a goblet, then does the same for herself. Sipping, you both walk back to the sitting room, and you seat yourself. Adao runs to her room, and returns with the guitar. "You should know why I'm Mistress Singer from Verisance Keep. It's partly because I'm one of the only people with a knack for music, and the other reason is because I can play-and sing. Would you like to hear a song?" Adao picks up her guitar, and rests it on her knee. She warms up for a moment, then begins. Adao finishes the song, and you clap, smiling. Adao stands and bows, laughing slightly. "That was great!" you say. "Thanks, " replies Adao, "If I Imprint, I'll be sure to sing to my dragon.."
"They would love it," you say, and stand. "I have a question. If you say no, that's fine, it's kind of personal. May I read your journal?" Adao shrugs, and grins. "Go ahead. I'm not a great literary writer-it might bore you to sleep." "We'll see." You chuckle and walk to her room, retrieving the journal and the key, unlocking it, and bringing it back to the sitting room. Adao brings out some pie for you. "I'm not the best cook. I burnt it a little." After that, the pages are blank. You lock the Journal back up, and inquire if there's any more that would be of interest to see. Adao thinks a moment- "Oh! Would you be interested in the portrait of me that Rubin did for me?" Adao blushes. "I'm really not that pretty. It's right up there, on the wall." You gaze up at the painting. Yes, that's Rubin's work, alright. You thank Adao for letting you investigate her cathair, and go on your way. 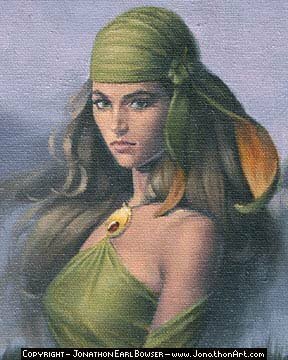 As Adao stepped foreward, the green began to croon softly, rubbing her head up and down the girls hand much like a feline would. I'm Feuilleth and I itch, itch, itch, itch, itch... Oh, that feels so good... Suddenly coming back to her senses, the green looked up to see her brother gone. Where did that Cielth go? Adao, I'm hungry. "Well if you'd stop scratching, then we might be able to go and get something," Adao chuckled, Feuilleth still rubbing her head up against her hand. "Ah, you've been itchy since the moment you rolled out upon the sands.." said Adao fondly to her little green. I know. I must've been cursed with perenial itchiness..d'you think it was my mother's or father's genes?